An online petition which claims that plans to build a dual carriageway through the land of Nobel Laureate Seamus Heaney’s birth will “annihilate” the area has gathered nearly 300 signatures. The landscape inspired the seminal ‘Digging’ by the famous poet as well as other masterpieces. The authorities in Northern Ireland want to build a road through Anahorish and Mossbawn – setting for some of his best-known work – as part of improved transport links between Belfast and Londonderry. The poet died in Dublin in 2013 and is buried in his home village in the area, Bellaghy. Chris Hazzard, the Executive minister overseeing the project, has said the chosen road alignment minimised the impact on the local community. The intention is to cut journey times on the arterial route and eliminate a major bottleneck. Mr Hazzard said more than 18,000 drivers used the road every day. According to campaigners it passes within 100 metres of the Heaney home, Mossbawn, setting for countless poems, and opponents claimed it will permanently destroy the scenic landscape surrounding it. Places immortalised in Heaney’s poetry include Anahorish, the Broagh, Hillhead, Lagan’s Road and the Strand at Lough Beg. The petition author claimed they could be permanently altered and “brutalised”. Reflecting on the proposed development a decade ago, Heaney said an alternative possibility to take the new road through an old aerodrome where there is an industrial estate would not be as much of a wound on the ecology. Mr Hazzard said his Infrastructure Department was acutely aware of the importance of the heritage sites relating to Heaney and paid attention to all objections raised. 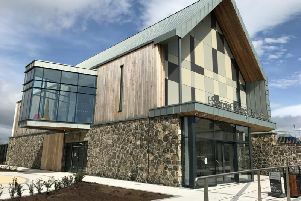 The Seamus Heaney HomePlace visitors centre in Bellaghy is due to open at the end of the month.